In this week’s episode of Mad Genius Tips, F&W’s Justin Chapple revealed the incredibly easy way to poach a dozen eggs in one go using a muffin tin. Here, eight great ways to show off this magical cooking trick at your next big brunch. Classic hollandaise sauce is prepared with butter, egg yolks and lemon juice. Here, Neal Fraser adds a red wine–and–port reduction to the rich sauce, which is delicious with the juicy tenderloin steak that accompanies the poached eggs. The combination of toasted bread, poached eggs, sizzling feta and olives is killer. It’s hard to go wrong with a recipe that features oozing soft-poached eggs, warm polenta and gooey, salty cheese. David Chang first made this recipe at a food conference in Copenhagen, when he had very little to work with. He simmered barley in local apple cider with chicken stock and kombu, creating a deliciously sweet and savory porridge. This spin on eggs Benedict has all the beloved elements of a Reuben sandwich. 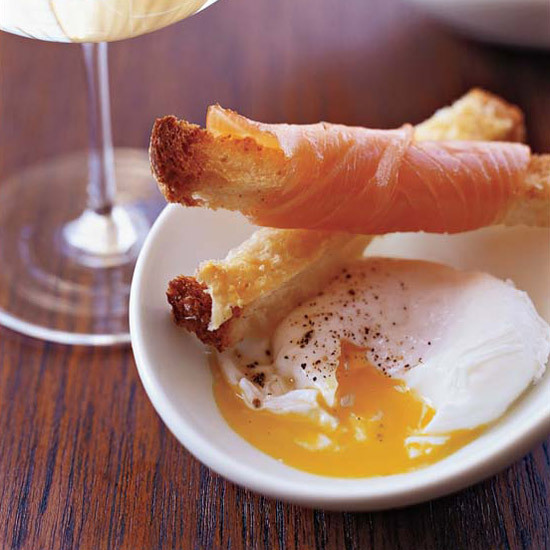 Dipping a crispy toast finger in a soft egg yolk has to be one of life’s great pleasures. Hash is a great way to use leftovers, like the cooked salmon called for in this dish. Cheesy grits and runny eggs are the ultimate comfort-food duo.